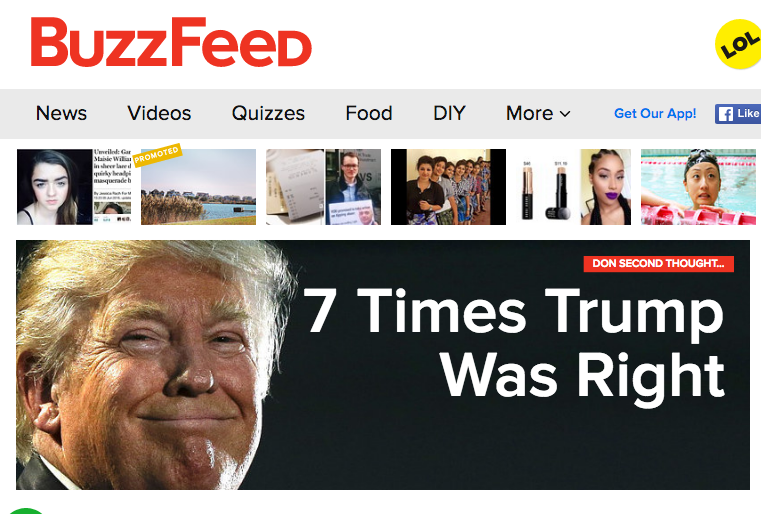 According to POLITICO, Buzzfeed has decided to pull out of the $1.3 million ad deal it had with the Republican National Committee to promote Donald J. Trump for President. Apparently, Buzzfeed has decided to take the Huffington Post approach to politics by openly picking sides, which means presumably that it doesn’t have issues with Hillary Clinton. What Trump has said is that the U.S. must secure its borders… like every other country in the world. Not a radical position according to millions of his voters. Many of his voters think that what is radical is not securing them! His voters also agree with Trump’s statement about Muslim travel following the terrorist attacks in Paris by ISIS operatives who had snuck (migrated) into Europe. Trump reacted to the crisis by saying that we should suspend foreign Muslim travel to the U.S. “until we can figure out what is going on” before a Paris like terrorist attack happens her in the U.S.
You can certainly disagree with his positions, but to act like they are extremely radical is simply hyperbole by Trump’s political opposition, which apparently includes Buzzfeed.